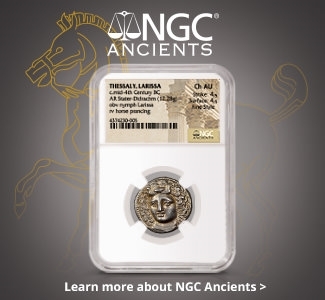 Coins of the Late Roman Empire have a remarkable variety of designs. 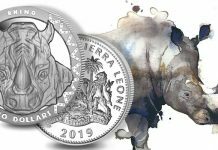 In the previous column, we examined some of the principal types encountered on the obverse – typically the imperial portrait. 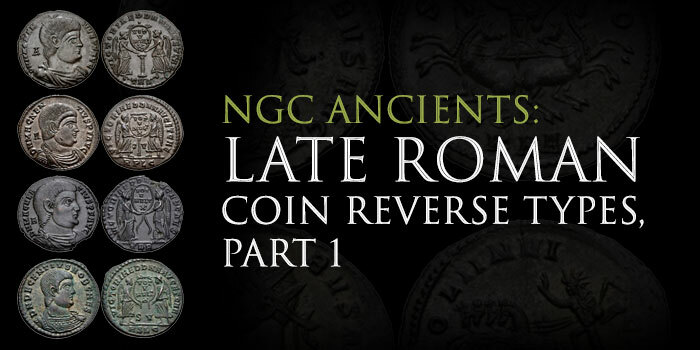 In this installment (and the one following) we’ll discuss some familiar reverse types of the Late Roman world, issued from about A.D. 268 through 476. It’s worth keeping in mind that these columns illustrate only a small percentage of reverse designs created at the mints of the Roman Empire. We’ll start with some basic types associated with the Roman army and its victories. 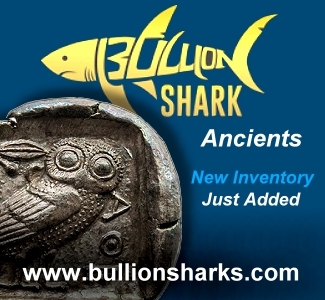 Below are four billon coins depicting the Roman goddess Victory. First is an aurelianianus of Probus (276-282), which shows Victory advancing, holding a wreath and a trophy. 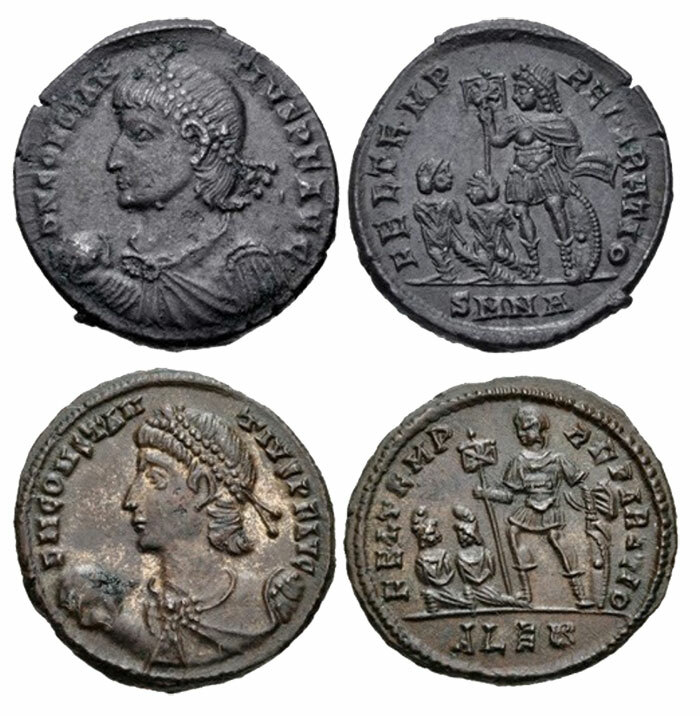 Next is an AE3 of the emperor Valentianian I (364-375) showing a similar image, except that Victory holds a palm branch rather than a trophy. 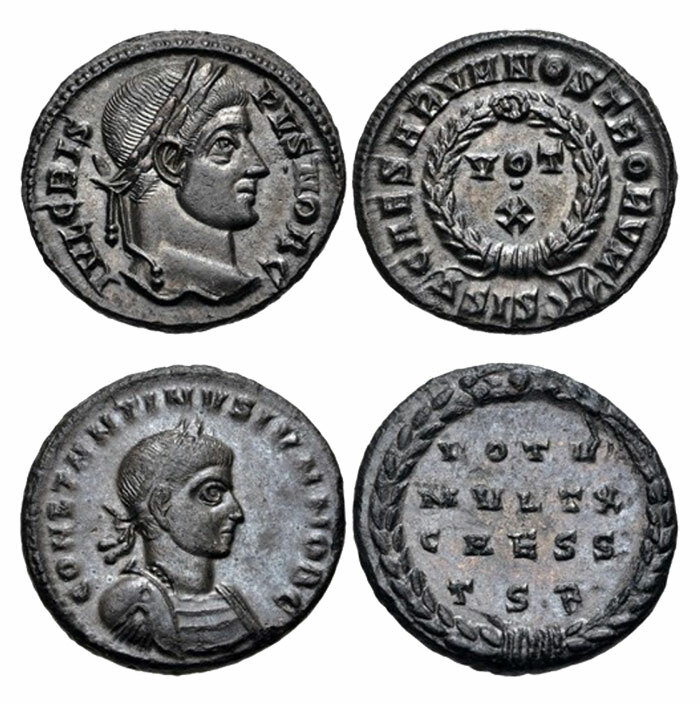 Below those are AE3s of Constantine I ‘the Great’ (307-337) and Constantine II (as Caesar, 316-337), which show Victory spurning an enemy under foot. The emperor was the supreme commander of the Roman army – even if, sometimes, he happened to be extremely young, incompetent or distracted. 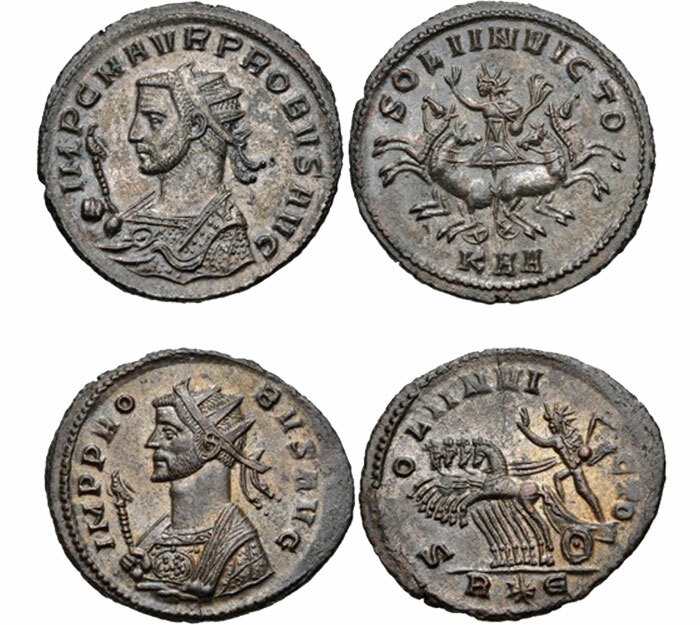 Above are coins of three effective emperors. 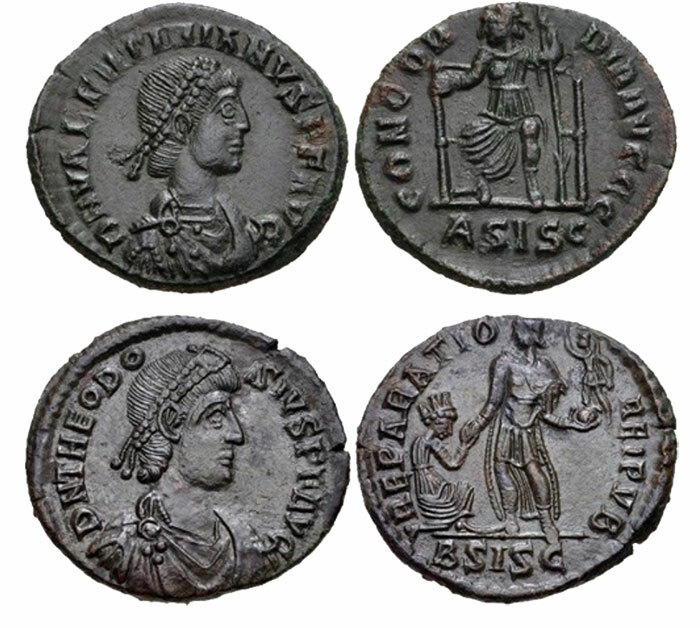 The first two, nummi of Constantine I ‘the Great’ and Vetranio (350), show the emperor holding two military standards; the third, an AE3/4 of Constantine II, shows two soldiers standing beside standards. A variety of other military themes occur, which often incorporate trophies and captives. 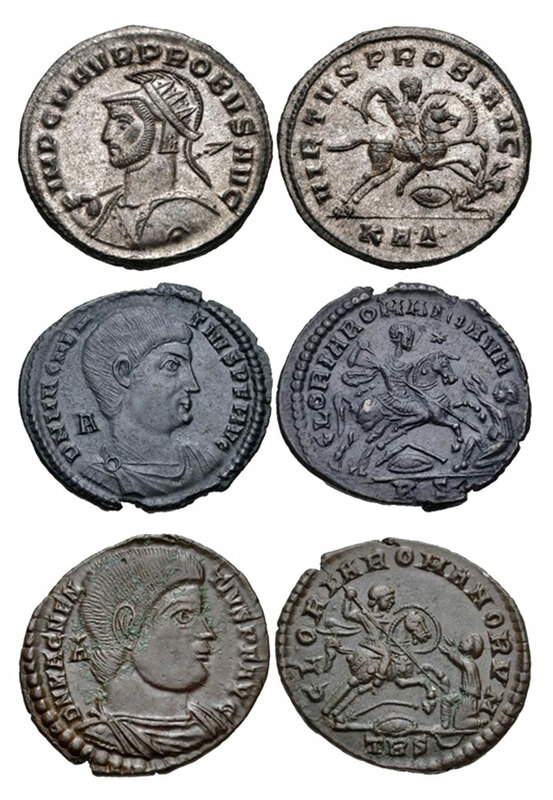 Above are a billon double-denarius of Claudius II ‘Gothicus’ (268-270) and a billon aurelianianus of Probus, both of which show bound captives at the base of military trophies composed of arms and armor. 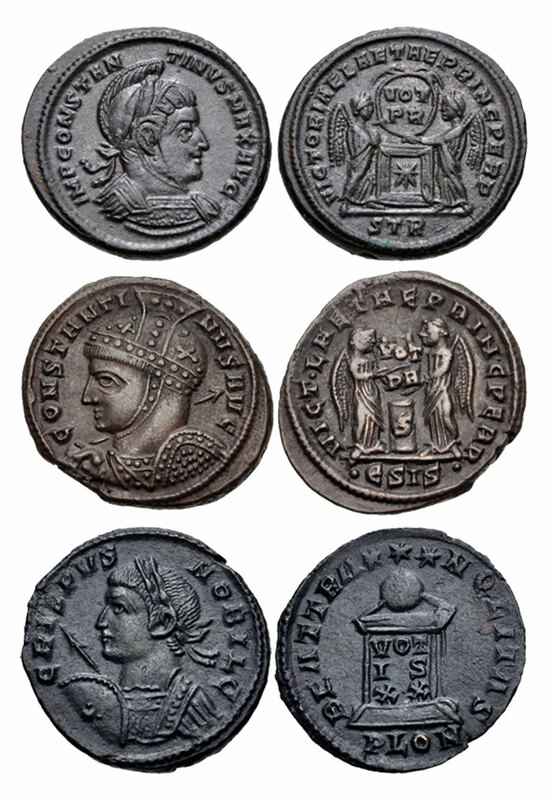 Emperors also were commonly shown with captives, with the intent being that such designs would stir pride and confidence in Romans while striking fear into the hearts of their enemies. 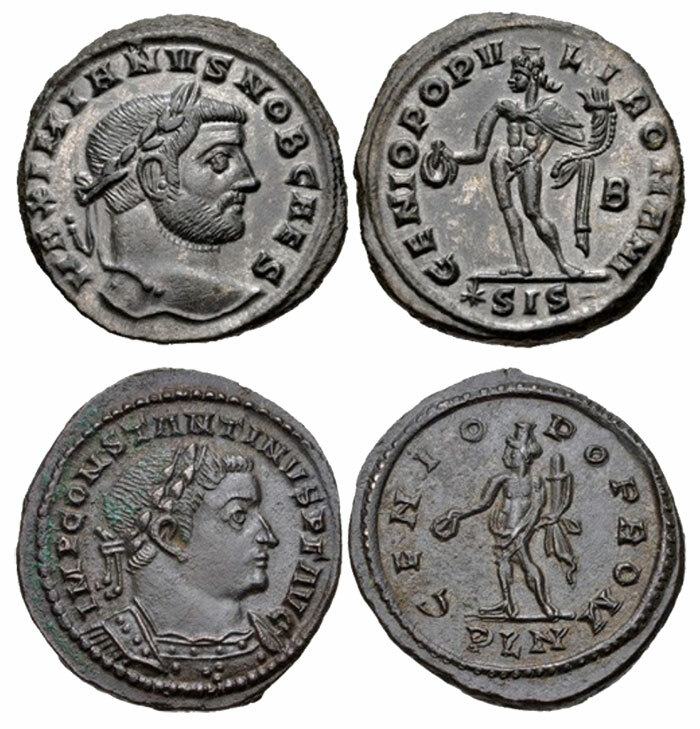 Above are two billon centenionali of Constantius II (337-361) showing the emperor standing beside two bound captives. 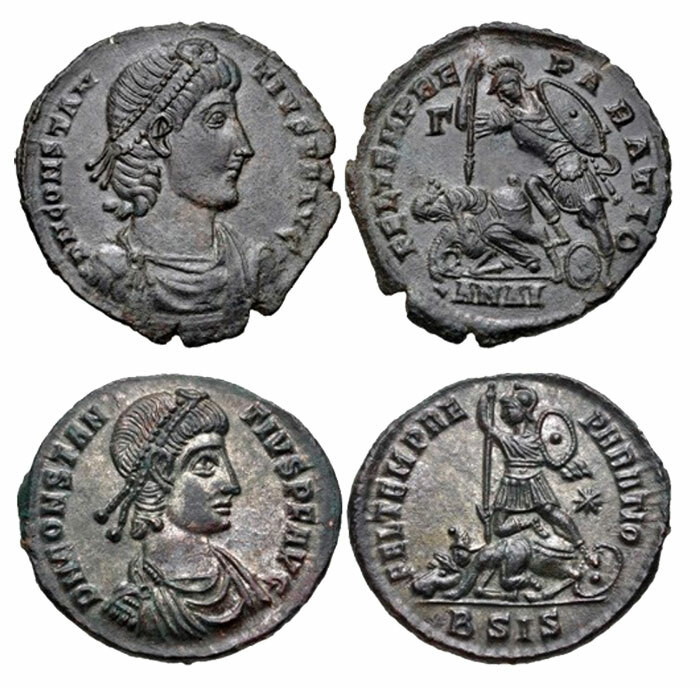 Above are two other coins showing emperors and captives. First is an AE3 of Valens (364-378), which shows him violently dragging a captive by his hair. 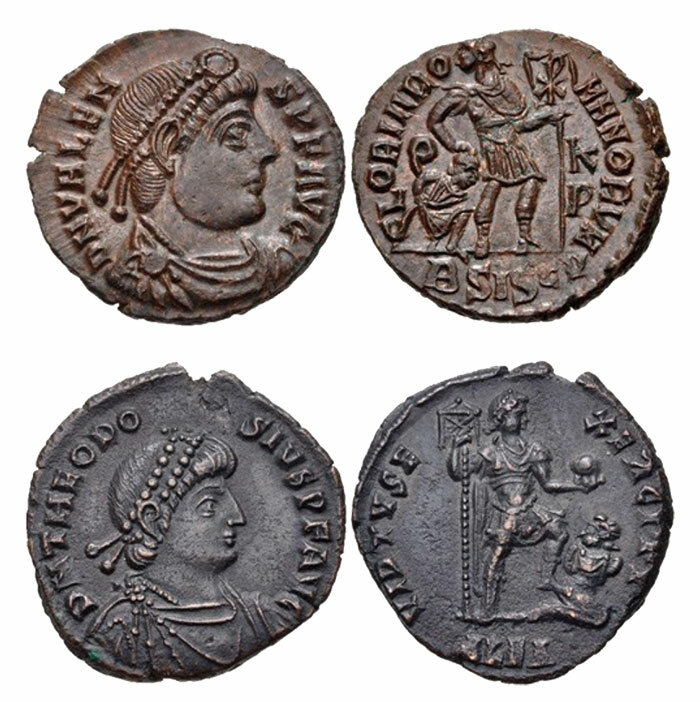 The second is an AE2 of Theodosius I (379-395), which portrays him treading upon a seated, bound captive. On the brighter side of Rome’s enemy relations, we can appreciate three billon centenionali of the mid-fourth Century. The first two are of Constans (337-350), the last is of his brother Constantius II. All show on their reverse the emperor (or a soldier) bringing a barbarian out from a primitive hut beneath a tree. 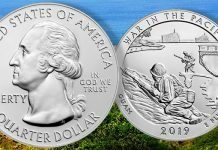 The question remains, though: is the barbarian being dragged out from his humble abode in a military sense, or is he being led out so he can leave behind his primitive ways and partake in what the Romans believed to be enlightenment and civilization? Now, back to some classic Roman military designs. Above is a billon aurelianianus of Probus showing the emperor riding a horse that is raising one of its front hooves over a bound captive. More energetic equestrian scenes appear on the three coins above, all of which show the emperor on horseback, spearing a fallen enemy. 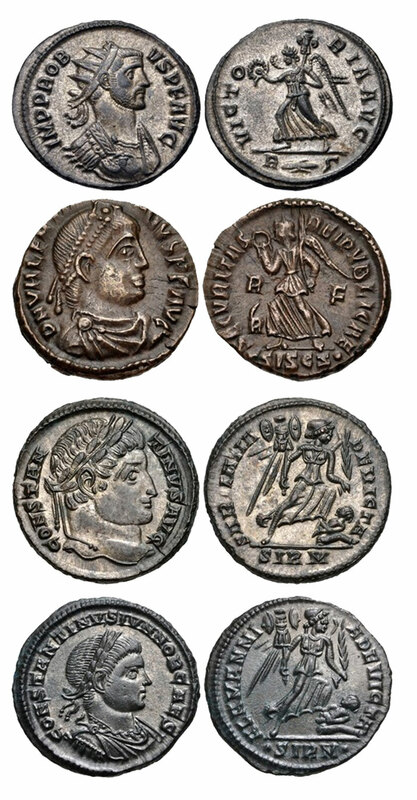 First is an aurelianianus of Probus, followed by two AE2s (centenionali) of the rebel Magnentius (350-353). 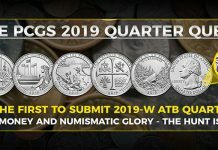 On the two coins above we have a role-reversal, demonstrating that Romans could triumph over their enemies even when they were on foot battling a mounted foe. 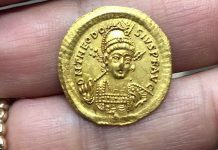 Both are billon centenionali of Constantius II. 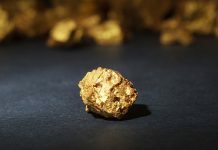 The Romans typically sought the favor of their gods in military affairs. 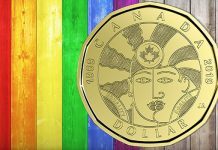 As seen on some of the coins above, the goddess Victory was portrayed on coin designs; she had been popular on Roman coins since Republican times and remained so throughout the empire. However, in the Late Roman world, the sun god Sol became especially popular with soldiers. Sol inspired singular devotion, which did much to pave the transition from the traditional Greek and Roman polytheism to Christian worship in the fourth Century. 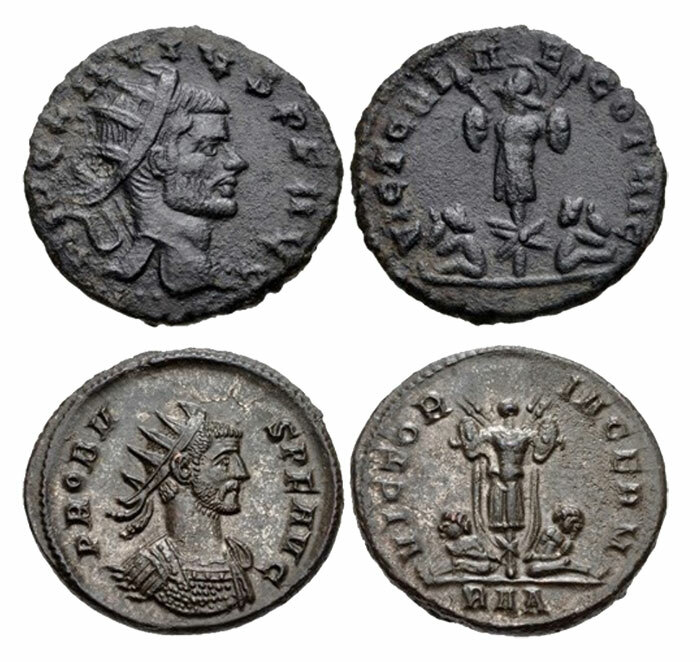 The four billon coins of Aurelian (270-275) above depict Sol with captives. The first two show the god treading on a captive; the next shows Sol with two captives, one of which he treads upon. The last shows the sun-god standing triumphantly with a captive at his feet. Sol also is shown riding in a quadriga, a four-horse chariot. Above are two billon aurelianiani of Probus showing Sol in his celestial chariot: on the first, he advances directly toward the viewer; on the second his chariot is shown in profile. 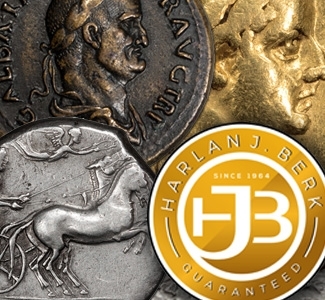 We round out our selection of coins depicting Sol with the three billon pieces above. 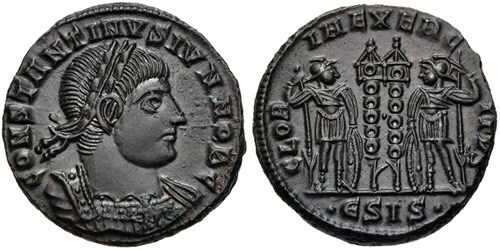 First is a reduced nummus of Constantine I showing the god standing; next is a reduced nummus of Constantine II (as Caesar) showing the god advancing; last is an AE3 with a most unusual design that generally is believed to show Sol upon a simplified plan of a Roman military camp. 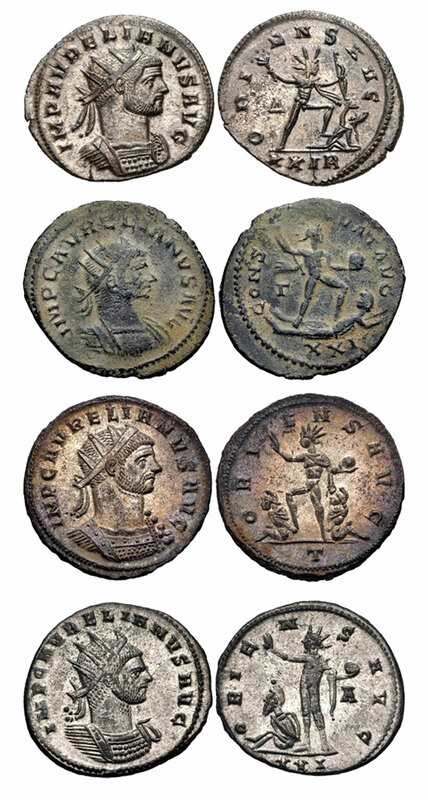 Deities other than Victory or Sol also appeared on Late Roman coins, including the familiar “Genius” that became the standard reverse type for the billon nummus introduced by Diocletian (284-305) in his great coinage reform. 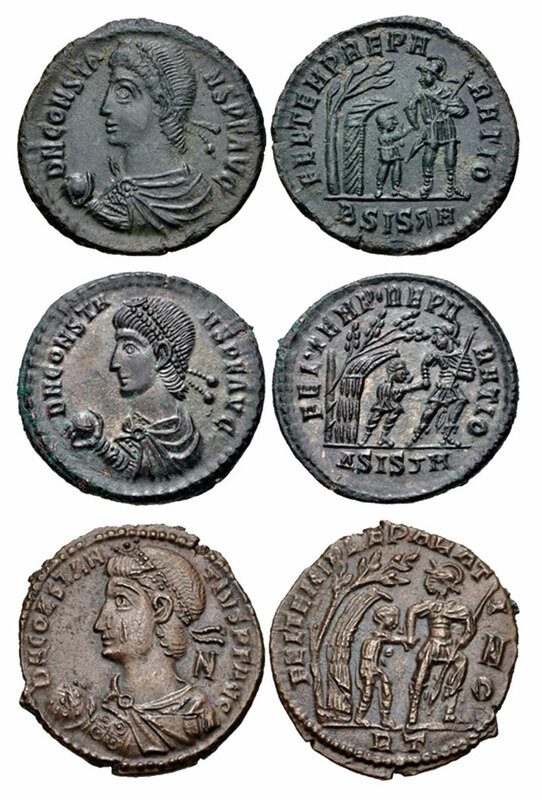 Two examples appear above: the first on a nummus issued for Galerius (as Caesar, 293-305), the second on a nummus issued for Constantine I. Another deity, Concordia, appears as a seated figure on the AE3 of Valentinian II (375-392) shown above. Beneath that is a generic ‘city-goddess’ who, on this AE2, is raised from her knees by the emperor Theodosius I, who also holds a globe surmounted by Victory. The last design concepts we’ll examine in this column are those related to the imperial vota. This was a traditional gesture taken by emperors to express their thanks for whatever time they already had ruled, and to take vows for additional years they hoped the gods would provide. 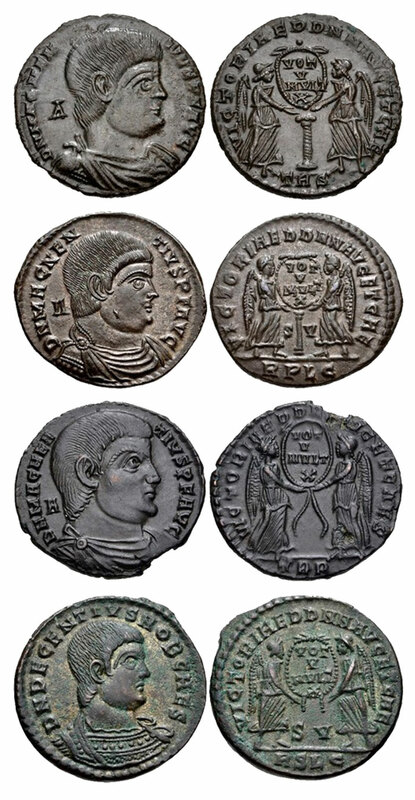 The most common types of votive coinage in the Constantinian era (c.313-364) appeared on billon AE3s of Constantine I and his sons, such as the two pieces above. The first is of Crispus (as Caesar, 316-326), the second of Constantine II. Both present votive formulas in a laurel wreath. On the first, Crispus gives thanks for 10 years, and on the second his younger stepbrother gives thanks for five years and offers a hopeful vow for 10 more. 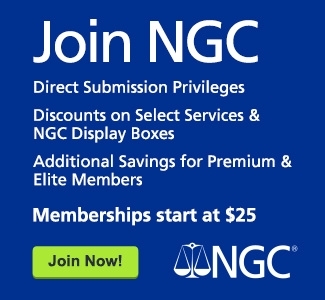 In the Constantinian era, vows commonly appeared on or above altars. Shown above are three billon AE3s with votive messages. 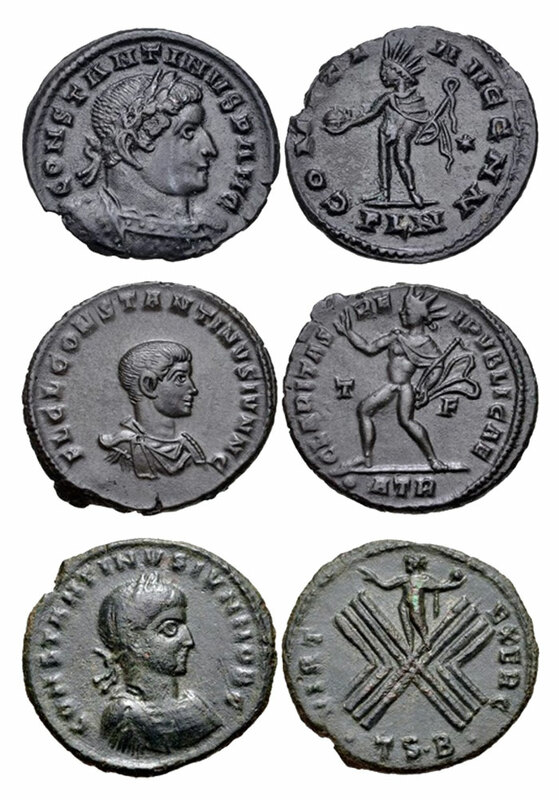 The first two are of Constantine I which show figures of Victory placing on altars (or cippi) a shield bearing generic vows – vota populi Romani – to the Roman people. Last is a coin of Crispus, who prematurely gives thanks for 20 years of rule in an inscription on an altar. The same general design concept was also used by the rebels Magnentius and Decentius (350-353), as seen on the four billon AE2s (centenionali) below. The first three are of Magnentius, the last is of his relative Decentius. All four show two victories bearing a votive message: thanks (prematurely) for five years, and hoping for 10. Unfortunately, neither rebel survived long enough to enjoy the longevity they claimed.